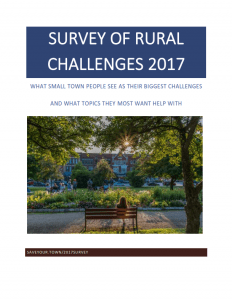 When you ask small town people what challenges they want help with, the responses provide an interesting insight into rural areas today. 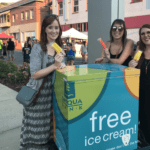 SmallBizSurvival.com and SaveYour.Town conducted a survey among their subscribers and visitors to their sites during 2017, receiving 250 individual responses. Now that you’ve seen the overview, you can download a PDF report with more details on the survey results. It includes more information on all the summary items in the overview slides, plus detailed responses to each survey question. Selected items from the open-ended questions add more depth, and charts help you visualize the challenges. You can also read the full text of each question that was asked on the survey. 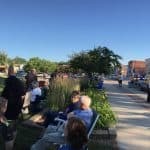 Using these survey results, Becky McCray and Deb Brown developed a special set of action steps you can take to shape the future of your town or the towns you serve. If you’d like a copy, we’ll also make sure you get weekly newsletters from Becky and Deb with ongoing support for your small town projects. Sign up here to get the action steps. Results from the 2015 survey are still available here. A total of 250 responses were collected online between February 17, 2017, and March 16, 2017, from subscribers and visitors to SaveYour.Town and SmallBizSurvival.com. Respondents identified themselves as rural, and 189 identified themselves as business owners by responding to the business question. Participants included 215 from the USA, 25 from Canada, 7 from Australia and 3 from other international locations. 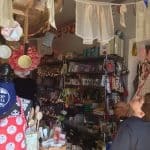 SmallBizSurvival.com is focused on rural small business. It was founded January 14, 2006 by Becky McCray from a small town in Oklahoma. It has been ranked in the top 30 small business blogs worldwide by Invesp BlogRank and BizHumm. McCray has been named one of the Power Players in Technology Business Media in 2013 and a Small Business Influencer Journalist in 2011, 2012, 2013, and 2014. She owns a retail business in a small town and a cattle ranch together with her husband. She provides practical steps you can put into action right away to shape the future of your town. 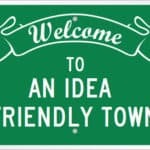 SaveYour.Town believes small towns can be saved. Deb Brown and Becky McCray joined forces in May 2015 to help small towns and rural communities thrive. They provide speeches and presentations internationally, site visits and community brainstorming sessions, and online video library and short courses full of practical steps that can be put into action right away. Deb Brown is frequently featured across the US as a speaker on rural issues, chamber of commerce topics, economic development, tourism, social media and marketing. Becky McCray is an international speaker and author, whose programs on small business, rural trends, economic development and marketing have given practical ideas to audiences at over 180 events in the US, UK, Canada and Australia.